I’m back out on the ledge again. Somebody talk me down. Today I read a news report from ABS-CBN in which the Philippine government proudly proclaimed that it will provide temporary bunkhouse shelter for 2,800 families in Yolanda affected areas by Christmas. Really? That’s 119 bunkhouses, each with 24 dwellings in the shelter — thus 119 x 24 equals 2,800 (actually 2,856). That’s it. Here we go again. Before I start — my credential for going on a rant about this is that my wife Rena and I have sixty family members rendered homeless by Typhoon Yolanda. Aside from the article cited above — tonight I overheard a conversation that my son Patrick had with a journalist who just returned from a trip to Western Visayas, and will be writing about it in the coming days. Take note: this refers to Western Visayas, the area you don’ t hear about — the area where Typhoon Yolanda (Haiyan) made its 3rd, 4th, and 5th landfalls. Until now almost all of the media coverage has centered on Leyte and Samar, in Eastern Visayas, where the storm first hit. He was completely shaken by what he had seen. Dozens (many dozens) of barangays that until now have relieved no relief at all. More uncounted bodies — so many that the journalist fears the official could may only be a small percentage of the real total. The journalist’s information is anecdotal, not statistical, but it got me to thinking. I’ve been really shaken lately by the enormity of the numbers for destroyed homes and displaced people that come out via statistical reports, compared (frighteningly) to the incredibly puny nature of the numbers for temporary shelter that is being provided. Now — ask yourself: Other than Leyte and Samar, how much are we hearing in the media about the other areas? Almost nothing. Yet look at them. Those are heavily populated areas and literally thousands of tiny coastal barangays (villages). Think about those numbers. That’s 1,000,000 homes destroyed, 2,300,000 households affected, and 11,200,000 people displaced. Those are staggering, hard-to-wrap-your-head-around numbers. Now plug in THESE staggeringly puny numbers, also from the government. Government temporary “bunkhouse” housing to be completed by Christmas – 2,800 temporary dwellings. How can they make these announcements with a straight face — as if this is actually addressing the problem? I am NOT saying that this is all the government has funding for, or is all it has in the pipeline. They have announced a P40B fund for rehabilitation, and there are other announcements, for example, regarding a P14B budget request. It’s not about how much budget has been set aside. It’s about how that money is being used, in a timely way, to address the most pressing needs of shelter for the homeless people out there. Are there other announcements that I’m missing — announcements that show that there is more concrete projects in the pipeline that address this massive problem? If anyone has seen announcements that I’m missing, please send them to me and I will adjust what I’m saying accordingly. But I’m not finding anything like that. what I’m finding is that there are disconnected statements coming out of the government — some statements referring to the funding that has been received or is in the pipeline, some statements regarding the calculated cost. But when it comes down to solid announcements about nearterm plans for addressing the problem of people rendered homeless …. very little seems to be happening. I still despair that people are getting it. So here is an “info-graphic” I made. 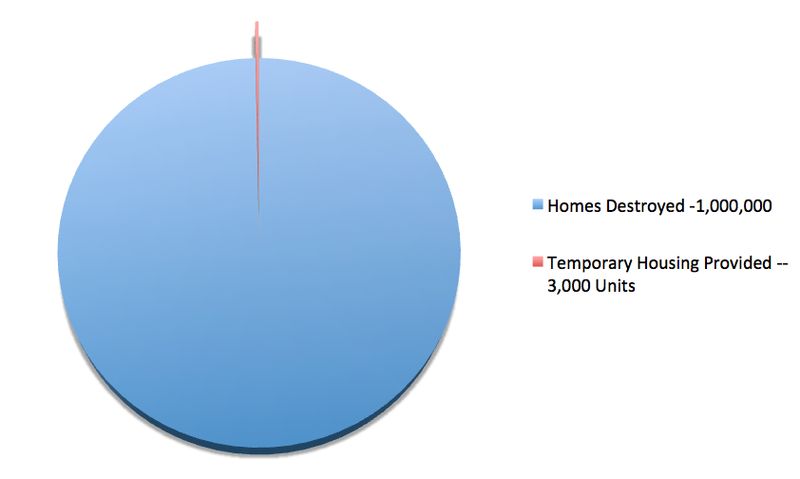 The blue is the number of people whose homes were destroyed. The red is the number of of people who will have temporary shelter eight weeks after the typhoon. Somebody talk me down off the ledge before I jump. If they would just temper their announcements with some words about the scope of the problem, it wouldn’t seem so insulting and frightening when they announce some miniscule pinprick of an effort. But they don’t do that. They proudly proclaim they are doing something meaningful when it’s not. And here’s an important larger point. The Philippines can’t do this alone but with the government acting as if they have it in hand — this lessens the sense of urgency felt by other nations and international organizations. So I’m not saying that the Philippine government is supposed to be able to handle this by itself. They can’t. The problem is too big. But what they can do, and must do, is make an honest case to the world about the massive scope of the problem and their inability to address it in a meaningful way. This is a global problem — we are all in this together, not just the Philippines, but the Philippine government is not raising the alarm and is instead minimizing the probem, making a show of having things under control when they don’t. This is just wrong. Mr. President — admin you don’t have it under control, cry out loudly and often for help, tell the world how bad it is and stop trying to minimize the problem. they dont have to lie, you know. they could have called for volunteering,cooperation & participation,instead. Roy, I figured there would be some reaction like yours. Sorry if I offended. You may have missed the fact that I have 60 family members homeless in Samar, so I’m not just pontificating from afar for no good reason. And the US record in handling Katrina is certainly no example of how this should be done. My main point, which you ignore, is that the government seems to be intentionally minimizing the situation which has the effect of causing potential donors to turn away. Even if the actual implementation of aid by the government “is what it is” (i.e. even if it doesn’t get any better) …. if the communication from the government was “we can’t hande this, we need help” — that would help. Instead the message coming from the government seems to be “we have this in hand — look at all the good things we’re doing” …..and yet on closer examination, “all the good things we’re doing” turns out to be woefully inadequate. A better message would be “We are a struggling third world country and we are overwhelmed by the scope of this disaster. We urgently need help from everywhere in the world. Please help, please don’t forget us.” I don’t hear that message coming from the government, and yes — I fault them for that. … 1,000,000 damaged/destroyed homes in 8 provincial islands … can you imagine the man-hour requirements to accomplish that task ?!?! … the ENTIRE man, material and machine resource requirements … of course, after rebuilding first the heavily devastated infrastructures (roads, bridges, power lines, airports, seaports) … if someone would generously shell out a lump sum of at least $3 billion in financial help (completely in monetary form) … that would eventually fast track the rehabilitation program in no more than 18 months for the typhoon victims of yolanda (haiyan) as everyone is envisioning … otherwise … PUT UP or SHUT UP !!! Roy… the main issue is not the government’s response rate. It is the fact that Pnoy admin already boasts as if everything has been take care of. Mar even said a few times that the worst is over when less than 1% of those that were left homeless have received shelter aid. Darewin, that’s well said. There is such a danger of prematurely declaring victory here when almost nothing has really been accomplished. Honest to god, if I were writing the press release, I would put it in perspective and make sure that people know a) we are doing something, b) there is much, much more to do, c) we “get it”. I am in total agreement with you on this matter. My food program, “Bucketful Of Rice”, has fed hungry children and needy families all over the Philippines since 2004, and continues today, as well as in 5 other countries. I am well-aware of the corruption and so much thievery in the Philippines government – and have paid unnecessary amounts of money before learning about it all. In my opinion, it will take a nation of individuals to change anything there. It can be done, but everyone needs to get involved with it all, get rid of the current government leaders, and try to find someone they trust to take their place. Sadly, things will never change there unless the countrymen do this, or the Philippines is invaded by another country. I hate to even mention any of this, but that is the problem already. No one is talking, but simply sitting back hoping someone else will take care of them, and make the changes for them. God bless you, sir, for not being afraid to talk. Feeding the hungry since 1977.